Habitat: The plant is native to Europe, Middle East and North Africa. It usually inhabits lakes and ponds. 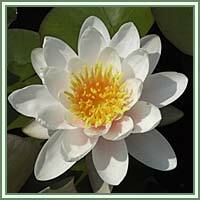 Description: White lotus is an aquatic perennial. It grows from an underwater stem. It has large and round, leathery leaves (30 centimeters in diameter). Beautiful multi-petaled, white flower, with bright yellow stamen in the centre, appears during spring (from June to September). Seeds are smooth, olive green in color. 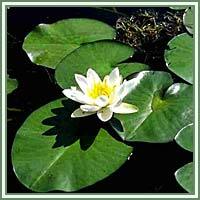 Medicinal use: White Lotus is considered to be an astringent, antiseptic, anesthetic, anaphrodisiac and sedative. It can be used in treatment of bronchial congestion, and it can disperse the stagnated mucus from the chest. A decoction made from the root is beneficial in treatment of diarrhea caused by irritable bowel syndrome, and also in treatment of dysentery. White Lotus flowers are considered to reduce sexual drive and to have a soothing and sedative effect on the nervous system. Therefore, they can be used in treatments of insomnia and different sorts of anxieties. Safety: The plant contains toxic alkaloids (nupharine and nymphaeine), substances that affect our nervous system. Some herbs could react with certain medication. Therefore it is advisable to contact your doctor/herbalist before consumption of any herb.